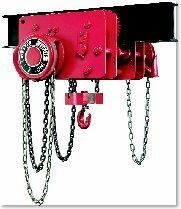 The Chester Zephyr Extended Handwheel Hoist is operated at a distance from the load, protecting the load from contact with the hand chain and making it easier to handle large, flat or bulky loads. Capacities from 1/2 to 2 tons are standard but consult us for higher capacities. The standard extension is 36 inches but more or less extension is available to meet your specific application.These units feature the same heavy duty components common to the Zephyr product line. A handwheel and swinging guard mounted on a shaft extension are coupled to the hoist mechanism. 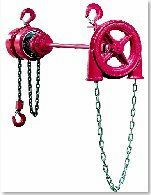 The hoist can be suspended from fixed supports or from trolleys for versatility. Handles tubes, frames, towers, drying and storage racks, auto and truck bodies, vats and tanks. 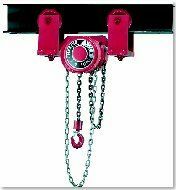 Suspension hooks can be hung from trolleys or fixed positions. CATALOG NUMBER STD. LIFT CAPACITY MAX. EXT. 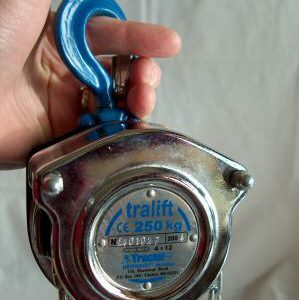 NET WEIGHT, LBS.